The stock market is like an excitable dog on a very long leash darting randomly in every direction. At any one moment, there is no predicting which way the pooch will lurch. But ultimately the dog is following a path determined by its “owner”, namely the fundamentals underlying (or in short, the fundies under) stocks such as earnings and growth prospects. What is astonishing is that almost all of the market players, big and small, seem to have their eyes intensely focused on the dog, and not the owner. Currently dog-watchers are fixated on “news” emanating from Washington D.C. The policy sausage-making process is rarely a pretty picture and perhaps even less so in the contemporary environment. While D.C. policies will likely have important implications, we think useful perspective can be gleaned from examining the fundamentals underlying the current investment environment. The fundies under are marked by several enduring trends. These trends may ultimately be influenced by what comes out of Washington D.C. fiscal policy sausage-making process, but are not dependent upon D.C. outcomes. It continues to be our belief that by focusing on the underlying fundamentals—the “owner” in Ralph Wanger’s analogy—the probability of investment success is maximized. Here’s the lay of the investment landscape as we see it. 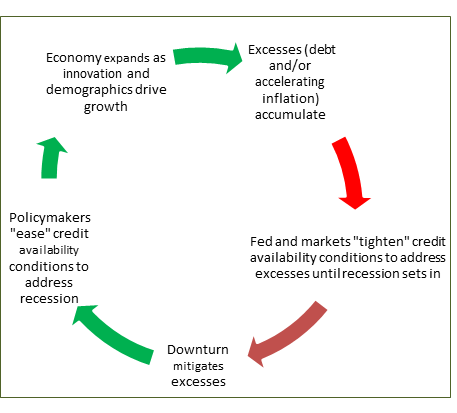 We believe the most compelling explanation for the business cycle pattern evident throughout U.S. history is that recessions are the result of accumulated excesses (usually debt and accelerating inflation)—and associated policy responses from the Federal Reserve (Fed). While there are—as always—areas of concern (student loans, subprime auto loans), excesses do not appear (yet) to have accumulated to the point where recession is a risk anytime soon. In recent years several of the regional units of the Fed have created useful gauges of business cycle conditions. Figure 1 (below) is one such example. The Chicago Fed’s indicators suggest neither market-based financial system measures nor overall Fed policy have become “tight” to presently represent threats to the economic expansion. Credit availability—both market based and Fed directed—becomes “tight” well before recession is triggered. These indicators are far from tight currently. Figure 1 is through March, 2017. The risk measure captures volatility and funding risk in the financial sector; the credit measure is composed of measures of credit conditions; and the leverage measure consists of debt and equity measures. Increasing risk, tighter credit conditions and declining leverage are consistent with tightening financial conditions. Thus, a positive value for an individual measure indicates that the corresponding aspect of financial conditions is tighter than on average, while negative values indicate the opposite. The Fed has raised interest rates under their control three times in the past 15 months. They are signaling more hikes in the near future as well. But wait, isn’t this tightening monetary policy? How can these actions be reconciled with what is reflected in Figure 1? The answer is twofold. As noted in an earlier Perspective “From Ultra to Extremely”, context is necessary. The Fed is raising interest rates from zero to rate levels that still are very low historically. In other words, policy is moving from ultra-loose (or easy), to extremely easy. The tightening impact on the economy from higher rates is likely very small and will remain so even as rates rise still more. Secondly, due to a significant operational change in the wake of the 2008 Financial Panic, the Fed can now raise interest rates without tightening financial liquidity within the economy. The operational change? The Fed now pays interest on reserves the banking system keeps on deposit at the Fed. As a result, the Fed can accomplish a rate hike simply by declaring they will pay a higher rate of interest on the banks’ reserve balances. And these balances are largely a result of the Fed’s earlier bond buying programs (so-called “QE”—quantitative easing actions). Prior to this operational change, when the Fed raised rates they had to drain financial market liquidity to make the desired rate hike “stick”. The liquidity drain had a tightening effect within the economy. There is very recent discussion about the Fed seeking to contract the size of their massive holdings of bonds sometime in the near future. Actions consistent with this will drain financial market liquidity. However, it is highly likely that bond sales by the Fed will be a very gradual process when it does occur. The bottom line about the current trends in Fed policy? The tightening impact on the economy from rate hikes under the current system is much less pronounced as Figure 1 reflects. And…if interest rate hikes are ever good news, this is one such period. For the lifting of rates by the Fed signals increased confidence that the perceived need for crisis level interest rates is no longer warranted. A “correction” versus a “bear market” in stock prices might seem like a distinction without a difference at first blush. The associated stock price decline in each event churns an investor’s guts. However, there is an important distinction. Corrections generally occur during an economic expansion and an upcycle in corporate earnings growth. Corrections occur as the “dog-watchers” suffer a panic attack of sorts out of fear of some news or event, sending stock prices lower. But the stock market regains composure in a relatively short period as solid corporate earnings growth and continued economic expansion provide resilience enabling stock prices to recover. Corporate earnings (profits) remain in an upswing coincidental with the economic expansion. 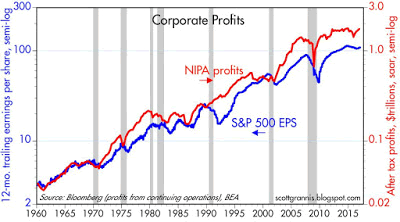 About Figure 2: NIPA=all businesses, S&P 500 EPS=earnings per share for S&P 500 companies. Bear market stock price declines, by contrast, are typically associated with recessions, and are longer, drawn out episodes. The economic downswing takes general corporate earnings lower and stock price erosion is material and persists. Corrections can happen anytime. Historically, 10% corrections occur more frequently than your birthday. The most recent 10% correction occurred in January and February of 2016. Stock prices recovered in a few subsequent weeks. Could we have another stock market correction soon? Sure. There are plenty of troubles around the world that can and will occupy investor attention from time to time. But with no recession on the horizon, continued economic growth, and a further advancement in corporate earnings (see Figure 2 above and Wall Street Journal excerpt below), the next bear market in stocks is not likely anytime soon. The time will indeed come to invest more conservatively before the next recession sets in. But the current fundies under suggest that time remains well off into the future. ”“Analysts are as upbeat about corporate sales as they’ve been in years heading into this earnings season. S&P 500 companies are expected to report first-quarter revenue grew 7.2% from a year ago, the fastest clip in over five years, according to FactSet’s tally of analysts’ forecasts. It’s no secret that baby boomers are retiring in huge numbers or that populations across the globe are rapidly aging. With these developments come significant shifts in consumption, borrowing, and investment patterns. This demographic transition has represented a headwind for many economies in recent years. But in the U.S., less appreciated is the fact that the next generation will soon exceed the baby boomers in number (the all-important working age group of 25-54 year olds already exceeds the boomers). 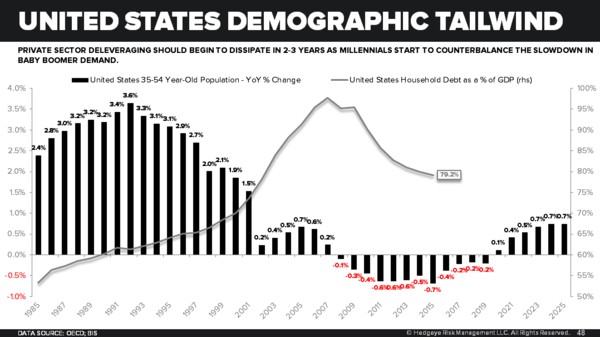 Whether defined as the 25-54 year olds or 35-54 reflected in Figure 3, these demographic “cohorts” have historically created the most number of new businesses, have the highest labor participation rate, formulate the greatest number of new households, and purchase the greatest number of homes and durable goods (appliances, cars, etc.). Pundits often site how this “next generation” is different than previous ones. Certainly every generation has its unique characteristics. We suspect, however, this group will exert an impact on the economy somewhat similar to those that came before. After all, if large numbers of the “counter-culture” boomers of the 1960s-early 1970s ended up exhibiting economic behavior resembling that of their parents (form households, buy houses, furnishings and cars), the so-called Millennials most likely will as well. The U.S. divorce rate is in decline and recently reached a 40-year low. The U.S. marriage rate has stabilized and is now rising among unmarried woman. The birth rate outside of marriage has declined in recent years and the majority of America’s children will continue to live with two parents. 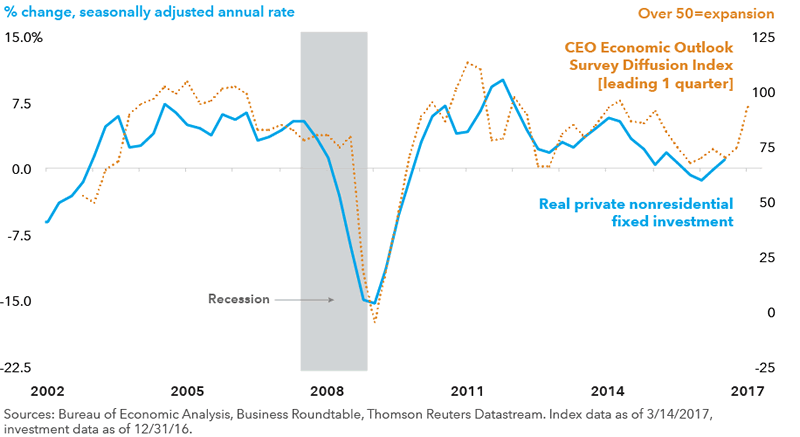 Incipient business cycle trend: Business investment to pick up? One of the weakest segments of the economy for a number of years has been private fixed investment. It is also a trend where policies from Washington D.C. can make a big difference. Figure 4 reflects recent trends in business investment and the About Figure 4 info below provides a formal description of just what constitutes private fixed investment activities. In a nutshell, these statistics seek to measure businesses spending to expand and improve their operations. Private fixed investments serve as a barometer of confidence in, and support for, future economic growth. Many believe the anemic recent trend in measured productivity growth is attributable to slow business investment spending. This is a very important topic since productivity growth is what ultimately propels the standard of living higher over time. More confidence in the economic future will lift business investment. Why have businesses been reluctant to spend? We’ve explored some of the theories on this topic in past Perspectives, but the following explanations stand out to us. A risk-aversion mentality was created by the 2008 Financial Panic. Fear, uncertainty, and doubt (FUD) about the future have remained pervasive features within the economy even as the shadow of the Panic lengthens. Another contributing factor, we believe, have been policies from Washington D.C. The Fed maintained a crisis monetary policy stance well into the economic expansion. This had the unintended impact of creating anxiety that the Fed feared another Panic could be just around the corner. Significantly increased government rules and regulations across major sectors of the economy also reinforced risk aversion. As we’ve noted before, just as helicopter parenting may stunt a child’s development by making them very risk-averse, so can a helicopter government. Figure 5 below provides additional examples of the wet blanket economic impact of increased red tape. 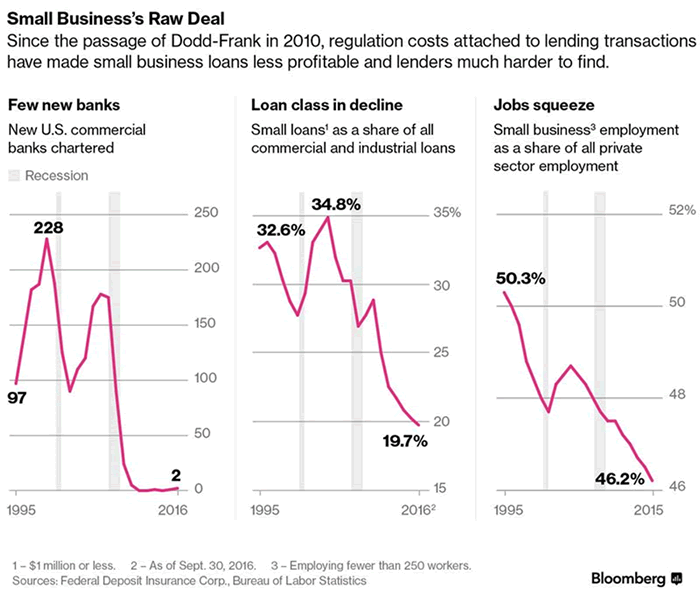 Regulatory wet blanket on small business. The new administration’s desire to cut regulations and lower corporate tax rates can go a long way towards easing business risk-aversion, in our estimation. We’ve already witnessed potentially good news in this regard as Figure 4 indicated. In Figure 4 you may have noticed that CEO confidence was depicted along with business investment activity. Confidence about the future is on the rise. Increased CEO confidence is generally a good leading indicator for future business investment spending. The second factor adding to risk-aversion on the part of businesses are the creative destruction trends of technology suggested in the first cartoon presented. Even as business spending has been weak, innovation has not rested. The emergence of the digital economy is continuing to disrupt many businesses and large segments of the economy. This is very unsettling to many. We’ll now turn our attention to this very important investment trend. Seventy-five years ago economist Joseph Schumpeter used the term creative destruction to describe U.S. economic dynamism. This term endures because it still cogently captures how innovation and progress impacts our economy. A new product, service, or way of doing business is created that proves popular with consumers. The “new” has a profound impact as it disrupts the previously status-quo economy as consumption patterns undergo significant change. Consider the big transitions in history. For the first 100,000+ years of human existence, the economy—to the extent it existed—was hunter-gatherer dominated. This was replaced by an agrarian-based economy. The age dominated economy was then displaced by a manufacturing-oriented economy as the industrial revolution unfolded. And starting some decades back, the transition to an information economy began to shake up the previous order. In each of these instances, innovation was the driving source of the creative destruction process. During the transitions from farming to manufacturing and the information phases, the destruction of the then-current order caused serious pain for meaningful numbers of economic participants. As resources shifted to the “new” economy, the gains of progress accumulated to the point where important forward economic progress became evident. The progress helped lift the general standard of living through two avenues. First, wages rose as productivity advanced. Secondly, the creation part of the innovation process increased both the availability and affordability of the new and desired goods to “common folks”. 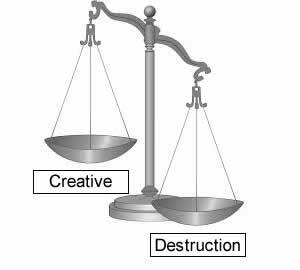 ”“The (creative destruction) process, not by coincidence but by virtue of its mechanism, progressively raises the standard of life of the masses. Warren Buffett recently offered an updated version of the nearby Schumpeter quote when he noted that the wealthiest man in history (John Rockefeller Sr.) didn’t live as well as the average person of today due to the goods and services that are now available and affordable to so many. Differences in income tell us less than they once did about differences in people’s real standards of living. And the immense potential of technology to reshape the lives of the rich and the poor simultaneously has yet to be fully understood and accounted for. In our time, ideas increasingly matter more than things, and information is often more valuable than tangible property. Under such conditions, Americans from different walks of life and in different economic classes have an ever-stronger common interest in promoting innovation. A society with advancing technology is a society in which everyone may rapidly reap the bounty produced by the most talented and entrepreneurial among us. More than ever before, our economy can be a positive-sum game in which gains for some rapidly redound to the benefit of all. Economist Bruce Sacerdote of Dartmouth very recently documented the narrowing of consumption differences across income categories that McGinnis posited.2 Sacerdote concludes that even as income disparity has widened, consumption disparity has narrowed significantly. ”“We are witnessing profound shifts across all industries, marked by the emergence of new business models, the disruption of incumbents and the reshaping of production, consumption, transportation and delivery systems. Electronic commerce is shaking up the retail landscape. Almost daily headlines tell the struggles of traditional retailers trying to cope with the significant transformation in shopping behavior underway. The struggles include store closings from iconic retailers, bankruptcies and mall closings. The payment system underlying many facets of commerce is changing rapidly. From Paypal’s Venmo, to Fiserv’s Popmoney, Apple Pay, Google Pay to bitcoin, change in the way we pay for things is rapidly evolving. Manufacturing may be near the front of the wave of digital change. The internet of things, software simulation, digital “twins”, 3D printing, cloud computing, artificial intelligence, the potential of quantum computing, and nanotechnology are changing the way physical goods are produced and operated and are opening the door for mass customization and converting goods into services-as crazy as that sounds! The auto industry is trying to redefine itself as technology increasingly makes cars and trucks “rolling computers”. Businesses models supported by advertising (like newspapers and TV) are in a state of major flux. The trend towards “cord cutting” in cable looks to be gaining momentum as streaming proliferates. Technological advances in extracting oil and natural gas out of rock (!) has turned the energy markets on its head. The U.S. is now becoming an exporter of energy and OPEC is in a state of great flux as a result. Meanwhile, the fundies under alternative energy sources continues to improve as technology evolves in this area as well. Medicine is not going untouched by technology either. Advances in biomedicine and new insights in human genome are bringing amazing new therapies and products to market. It’s not inconceivable that just as the oil and gas market has been totally changed by technology by a relatively few intrepid entrepreneurs, a similar transformation in healthcare could occur in the not-too-distant future. We noted earlier that measured productivity growth has been anemic. In an economy undergoing disruption across many sectors, the world is standing with one foot still on the status quo while the other foot is on the emerging digital world. The legacy resources committed to the status quo are being rendered less productive by new digital delivery methods yet the transition to new means is incomplete. This situation likely drags down measured productivity. Take retailing as an example. Many retailers continue their rush to “omni-channel” strategies— maintaining lower-productivity brick and mortar stores while building out e-commerce options. But as more shopping occurs on-line, more of the considerable physical infrastructure that exists becomes even less productive. Returning for a moment back to the bigger picture about productivity; part of the low anemic measured productivity might be the result of productivity statistics themselves being disrupted by technology! To see what we mean, look back at our opening cartoon. The cell phone has, in many circumstances, replaced several physical devices. Whether it’s this development or the retail digital shift, technology is “de-materializing” significant aspects of the economy. However, the statistics used to impute productivity are good at measuring an economy that is using increasing amounts of material. De-materialization likely confounds the measurement of economic growth and productivity. In addition, some things which previously added to GDP (physical maps, encyclopedias, etc.) have been replaced by free apps. The GDP statistics and the economists’ traditional tools were designed for a manufacturing-based economy that no longer exists. This is not a new issue by the way. Economist Robert Solow noted back in 1987, “you can see the computer age everywhere but in the productivity statistics!” The measurement problem has only become more complicated since then. Despite these issues, we suspect even measured productivity growth will soon be on an upswing. Change is uncomfortable. An economy being disrupted by creative destruction creates lots of angst. It has likely always been the case. Whether it was the Luddites smashing machinery in the 1800s in attempts to protect artisans from (then) “high-tech” looms, to Presidents worrying about new technologies of the day (see Hoover and Kennedy quotes), fears about “where will the new jobs come from” has accompanied economic advancement. ”“Unless there is a slowing down of mechanical inventions, grave mal-adjustments are certain to result. ”“(Automation) carries the dark menace of industrial dislocation, increases unemployment and deepens poverty. The angst is real…and understandable for the destruction part of the creative destruction equation is usually observable. The shuttered business establishment, the neighbor or kin that has been laid off, these things can be seen in so-called real time. The benefits of the creation side on the other hand—including the associated jobs, are typically only seen with the benefit of hindsight. Because it is hard to see—except in hindsight—the benefits of the creative side within the creative destruction equation, and destruction is readily observable, the thumb is typically on destruction in the scales of popular opinion. 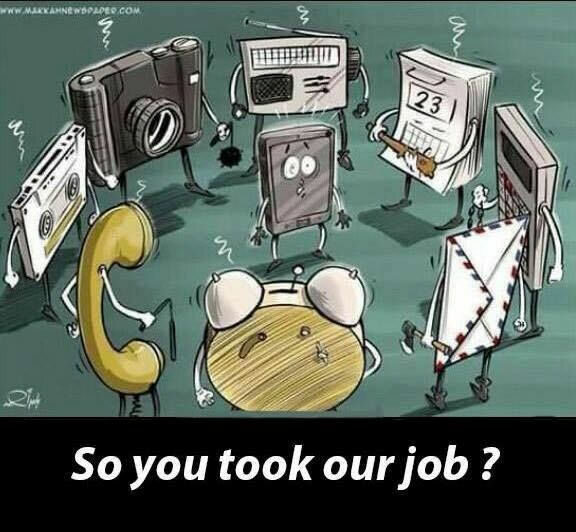 What will be the new jobs created in this current phase of creative destruction? It is hard to know. But think back for a moment to the shift from the days when most of the U.S. population were farmers. Today less than 2% of the population are farmers. Where were the jobs to absorb all these folks? Who could have foreseen the rise of brand new industries such as professional sports and athletic shoes and clothes as multi-billion dollar industries employing many thousands? Or the rise of the entertainment industry and leisure time activities or the emergence of the entire service sector itself? From an investment perspective, the creative destruction trend is creating big winners and losers. We believe we own many companies that are at the forefront of the creative forces. We also constantly assess “our” investments’ (we personally own them as well) abilities to withstand emerging destructive forces. Technology is not about to solve all of the world’s problems, of course. Troubles, problems and issues will always exist. But the future will offer rich investment potential as human ingenuity knows no bounds. ”“There is no limit to entrepreneurial ability and technological advances or the capacity for sound investment. There will be lots of interruptions that capture the dog-watchers’ attention on the path ahead. As always, enduring volatility will be the price of capturing rewarding returns. Constant vigilance and assessment of the fundies under will be necessary to maximize the probability of investment success. History and Resilience →	← The Big Recalculation?